At approximately 3 p.m., officer responded to a 9-1-1 report of a badly injured nine-year-old boy, next to a tree in McCarren Park, in Williamsburg, Brooklyn. Father then explained that treehouse was a eco-friendly “flat-pack” design meant to lower shipping costs, and that upon being fastened to a tree with cargo straps–and only cargo straps–the structure simply collapsed when his son tried to climb in on a rope. Officer would like to point out: Perhaps that’s why the design’s marketing pictures show it so comically close to the ground? 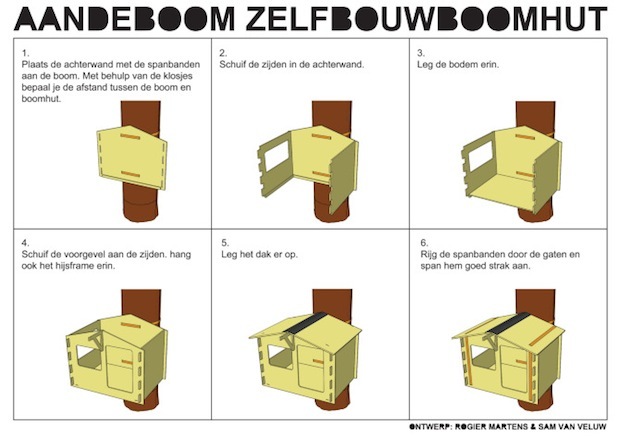 Father also explained that the contraption was designed by Aandeboom: “They’re cool. Dutch. They’ll be coming out with more stuff this spring.” Officer recommends assigning a worker from Child Protective Services, and investigating whether flat-pack has gone way too far. Also recommends just building your kid a damn treehouse using imagination and scrap wood.